The samsara of life and death is endless until one finds liberation or moksha states the Hindu way of life. Until the elusive Moksha is attained either by good karma or nirvana life goes on between birth and death. No organism can escape the fate. Yet in Hindu Dharma, we come across 8 such personalities who are blessed or cursed with immortality and are said to be still living amongst us. They are referred to as the Astha Chiranjeevi or the Eight Immortals. In Sanskrit, Chiranjeevi means a long-lived person, Chiram (means long) and Jivee (means lived). The word is also known as Amaratva or Immortality. In Hindu religion eight chiranjeevis are the eight immortals who have lived from one Satyayuga to another, i.e are alive on our earth and they will remain alive through Kali Yuga and wait for next Satya Yuga. These 8 Immortals (Chiranjeevi) in Hindu religious texts are Asura King Mahabali, Maha Rishi Markandeya, 6th Vishnu Avatar Parashurama, Vibhishan, Hanumana, Ved Vyasa, Kripa-Charya, and Ashwatthama. Ashwathaama Markandeyarr Vyaso Hanumanash cha Vibhishana Krupacharya cha Parashuramam Saptaita Chiranjeevanam. Mahabali was the great great grandson of sage Kashyapa, great-grandson of Hiranyakshipu, the grandson of Prahlada and son of Virochana. His state was run in peace and was prosperous. Bali had arranged Ashwamedha Yaga to maintain his dominance over three worlds. This created tensions and insecurity in heaven and amongst the Gods. Eventually, Lord Vishnu was asked to step in and In the request of Devas. Vishnu came in his Vamana avatar near Bali in time of the rite and asked Bali to grant land. Vamana or Brahmin Boy (Vishnu Avatar) asked only for a land that he could cover with his three steps. Bali granted the boon and Vishnu avatar Vamana traversed all the earth and Heaven with his two steps and Bali offered his head as a stepping stone to Vamana for the last step. Bali, at last, was compelled to be underworld. Pleased by Mahabali’s devotion, Vamana also blesses Bali to be the Indra during the period of the Manu known as Sāvarṇi. Due to Bali’s selfless devotion, dharma and an unwavering word he was granted to pay a visit his land one time each year. In this regard, Onam festival is celebrated in Kerala to welcome Mahabali to his land every year. A devotee of both Shiva and Vishnu Sage Markandeya belonged to the Bhrigu clan. Legend of his birth goes as this: Mrikandu rishi and his wife Marudmati worshipped Shiva and sought from him the boon of begetting a son. As a result, he was given the choice of either a gifted son, but with a short life on earth or a child of low intelligence but with a long life. Mrikandu rishi chose the former and was blessed with Markandeya, an exemplary son, destined to die at the age of 16. Markandeya grew up to be a great devotee of Shiva and on the day of his destined death, he continued his worship of Shiva in his aniconic form of Shivalingam. The messengers of Yama, the god of death were unable to take away his life because of his great devotion and continual worship of Shiva. Yama then came in person to take away Markandeya’s life and sprung his noose around the young sage’s neck. 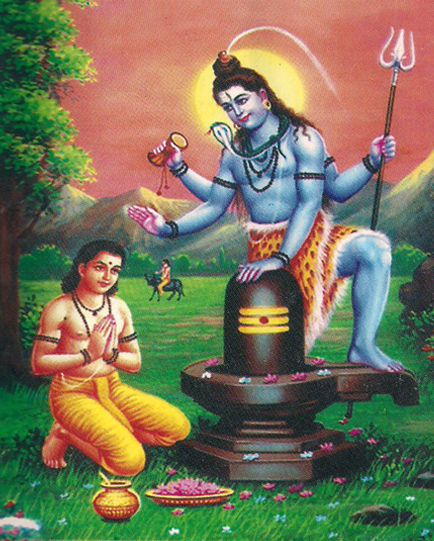 By accident or fate the noose mistakenly landed around the Shivalingam, and out of it, Shiva emerged in all his fury attacking Yama for his act of aggression. After defeating Yama in the battle to the point of death, Shiva then revived him, under the condition that the devout youth would live forever. For this act, Shiva was thereafter also known as Kalantaka (“Ender of Death”). The weapon wielding temperamental avatar of Vishnu was a warrior and feared and respected by many. Born in a Brahmin family, he was unlike the other Brahmins. Instead, Parshuram carried traits of a Kshatriya. He carried a number of Kshatriya traits, which included aggression, warfare, and valor. Hence, he is called as a ‘Brahma-Kshatriya’ as he had skills from both the clan. Parshuram is of a martial Shraman ascetic. However, unlike all other avatars, Bhagwan Parshuram still lives on earth, even today. Secondly, he is an Avesha Avatar, a secondary type of Avatar. In such an Avatar, Vishnu does not directly descend as in the case of Rama or Krishna but instead enters the soul of a man with his form. It is said that King Kartavirya Sahasrarjuna and his army forcibly tried to take away Parshuram’s father’s magical cow named Kamdhenu. Being angry and revengeful, he killed the entire army and King Kartavirya. In revenge for their father’s death, the king’s son killed Jamadagni in Parshuram’s absence. Furious and hurt by their act, he went ahead killing all the king’s sons and corrupt Haihaya Kings and warriors on the earth.He conducted the Ashvamedha sacrifice and gave away his entire holdings to the priests who conducted the ritual. In the Mahabharata, Bhagwan Parshuram was the Guru of the warrior Karna. According to the folklore, Parshuram gave the Sudharshan chakra to Lord Krishna. It is believed that the main motto of Vishnu’s sixth incarnation was to free the earth’s burden by assassinating the sinful and irreligious kings who neglected their duties. Another story mentioned in the Kalki Purana believes that Parshuram still resides on the earth. It states that Parshuram will be the martial guru of Shri Kalki, who is going to be the last avatar of Lord Vishnu. He instructs Kalki to perform a long sacrament to please Lord Shiva. After being pleased Lord Shiva will bless Kalki with the celestial weaponry. Vibhishana was a younger brother of the Rakshasa(demon) king Ravana of Lanka. Though a Rakshasa himself, Vibhishana was of a noble character and advised Ravana, who kidnapped and abducted Sita, to return her to her husband Rama in an orderly fashion and promptly. When his brother did not listen to his advice, Vibhishana joined Rama’s army. 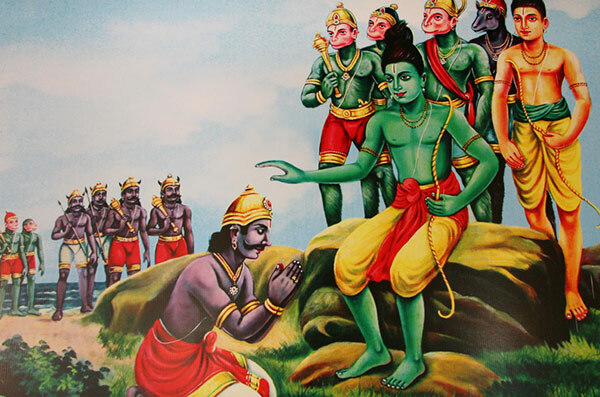 Later, when Rama defeated Ravana, Rama crowned Vibhishana as the king of Lanka. Symbolically, Vibhishana represents the devotion to Shri Rama and as a demon devotee, he shows that the Lord does not distinguish between his followers based on birth or circumstances in life. At end of his Rama avatar, Lord Vishnu ordered Vibhishana to stay on earth and serve the people and guide them to the path of truth and Dharma. Hence, Vibhishana is considered one of the seven immortals or Chiranjeevins. Lord Vishnu also ordered Vibhishana to pray the family deity of Rama’s natal Sun Dynasty, Lord Ranganatha. In Hindu religious texts, Hanuman was born to Anjana and father Kesari. Hanuman is also called the son of the deity Vayu (Wind God, himself the son of Vishnu) because of legends associated with Vayu’s role in Hanuman’s birth. According to certain legend, while his mother was worshiping Shiva, the King Dasharatha of Ayodhya was also performing the ritual of Putrakama yagna in order to have children. As a result, he received some sacred kheer to be shared by his three wives, leading to the births of Rama, Lakshmana, Bharata, and Shatrughna. By divine interposition, a kite snatched a fragment of that kheer and dropped it while flying over the forest where Anjana was engaged in worship. Vayu, the Hindu deity of the wind, delivered the falling pudding to the outstretched hands of Anjana, who consumed it. Hanuman was born to her as a result. The Sundara Kanda, the fifth book in the Ramayana, focuses on Hanuman. Hanuman meets Rama in the last year the latter’s 14-year exile, after the demon king Ravana had kidnapped Sita and helps them find her and defeat Ravana. Hanuman is extraordinarily strong, one capable of lifting and carrying any burden for a cause. Hanuman is presented as the exemplary devotee (bhakta) of Rama and Sita. The Hindu texts such as the Bhagavata Purana, the Bhakta Mala, the Ananda Ramayana and the Ramacharitmanas present him as someone who is talented, strong, brave and spiritually devoted to Rama. Several versions of Ramayana state that towards their end, just before Rama and Lakshmana die, that Hanuman is blessed to be immortal. He will be a part of humanity forever, while the story of Rama lives on. Vyas, the great scholar, and writer, the author of Mahabharata and the Srimad Bhagavatam, is another immortal, a shining beacon of erudition and wisdom. A katha-wachak reading from the holy texts is said to ascend the Vyaspeeth — blessed by the immortal Vyas. He comes to represent the continuity of erudition, scholarship and the apotheosis of the writer as the ultimate visionary. Vyasa is also considered to be one of the seven Chiranjivins (long-lived, or immortals), who are still in existence according to Hindu belief. According to the Vishnu Purana, “Veda Vyasa” is a title applied to the compilers of the Vedas who are avatars of Vishnu; 28 people with this title have appeared so far. The festival of Guru Purnima is dedicated to him. It is also known as Vyasa Purnima, on his birthday. It is said that he was the expansion of the god Vishnu who came in Dwaparayuga to make all the Vedic knowledge available in the written form which was available in spoken form at that time. He was the son of Satyavati, daughter of the fisherman Dusharaj, and the wandering sage Parashara. Hindus traditionally hold that Vyasa categorized the primordial single Veda into three canonical collections and that the fourth one, known as Atharvaveda, was recognized as Veda only very much later. Hence he was called Veda Vyasa, or “Splitter of the Vedas,” the splitting being a feat that allowed people to understand the divine knowledge of the Veda. Kripacharya is one of the most remarkable and important characters in the Mahabharata. He taught warfare to the young princes of Mahabharata. After the Kurukshetra war, he also taught Parikshit, the grandson of Arjuna. Kripacharya is one of the epitome of the virtue of impartiality. Though he was aware that the Kauravas were resorting to immoral ways, he impartially carried out his duty and proved his gratitude to the Kauravas as they nurtured him with food and shelter in the palace. Immortality was conferred on Kripacharya by Lord Krishna through a blessing. Kripacharya was prioritized for the conference of immortality even above Dronacharya since Kripacharya demonstrated some great virtues like truth, righteousness, and impartiality. Even under highly stressful conditions he was not prepared to compromise with his values and in this regard, he stands out as the noblest among men. Ashwatthama is considered as an avatar of one of the eleven Rudras and one of the seven Chiranjivi. Along with his maternal uncle Kripa, Ashwatthama is believed to be a living survivor of the Kurukshetra War. Ashwatthama was the son of Dronacharya and Kripi. Drona did many years of severe penance to please Lord Shiva in order to obtain a son who possesses the same valiance as Lord Shiva. Born a Chiranjivi, Ashwatthama was born with a gem in his forehead which gives him power over all living beings lower than humans; it protected him from hunger, thirst, and fatigue. On the night after Duryodhana’s defeat, a very disturbed and restless Ashwatthama had an idea of attacking the Pandava camp at night. Once arriving at the Pandava camp, they found a Bhairava blocking their entry. So Ashwatthama worshiped Lord Shiva for the fulfillment of his desires, offering himself as an oblation and pleased Shiva and Parvati. Ashwatthama first kicked and woke up Dhrishtadyumna, the commander of the Pandava army and the killer of his father Drona and strangled him. At this point, there are numerous different versions of the story. In some, Ashwatthama mistakes the sleeping Upapandavas as the Pandavas and kills them. In others, he knows he is killing the Upapandavas and does so because he cannot find the Pandavas. The Pandavas and Krishna return the next morning to the massacre and search for Ashwathama who seeks refuge in Vyasa’s Ashram. Seeing his end Ashwasthama invoked he deadly Brahmaastra only to be faced with another rBrahmastra from Arjuna. Vyasa knowing the havoc the deadly weapons could wreck asked the warriors to revoke the astras. Arjun did so but Aswashtama was unable to do so and instead diverted towards Uttara’s womb where the sole lineage of Pandavas was living. Lord Krishna protected the baby and in turn cursed Aswasthama. Ashwatthama was asked to surrender the gem on his forehead and was cursed for 3000 years that he will roam in the forests with blood and puss oozing out of his injuries and cry for death. Since he had no fear of death during the war, death would not meet him. He will have neither any hospitality nor any accommodation; he will be in total isolation without any contact of physical communication from mankind and society. The wound caused by the removal of this gem on his forehead will not heal and his body will suffer from a host of incurable diseases forming sores and ulcers that would never heal for 3000 years.